New York City, USA. Joint exhibition with Japanese artist Yoshio Okada. Click here for gallery website. New York City, USA. Click here for website. New Jersey, USA. Recycling: Washi Tales performance and workshop. Click here for a video about the performance. New Jersey, USA. 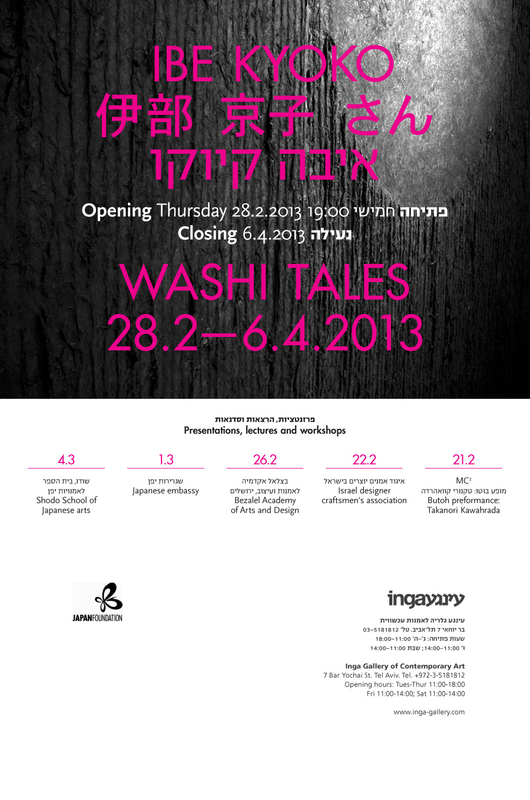 Washi Tales exhibit. New York City, USA. Recycling: Washi Tales performance and workshop. Chicago, USA. "Galaxy" collection will be exhibited until mid April. Tel Aviv, Israel. Solo exhibition. Kkyoko is invited to Israel as a part of the celebration of 60 year anniversary of diplomatic and cultural relation between Israel and Japan sponsored by Japan Foundation. Click here for the schedule. Kyoto, Japan. Exhibition as part of 2012 Kyoto Art and Culture award. Click here for photos from the exhibition. Click here for a blog entry from LACMA curator Hollis Goodale about Kyoko and the performance. Stage installation for the world premiere of Recycling: washi tales which will be performed in LACMA. Group exhibition, The Contemporary Japanese Fiber Art Exhibition. Installation for the entrance atrium for the celebration of 40 year anniversary. Click here for a review of the show by Carol Westfall. Solo exhibition. Palm Desert, California.